Hi everybody! Thanks for outfit ideas ;) what are you thinks about shopping app? Do you use them? I know InFitting, Chicisimo and WEAR. Maybe it’s good idea make a comparison video. Really, however stylefull…why walk around in a skirt looking like a solid-colour chintz parachute with the orange ropes hanging on the back hem…a typical case of a fashion victim wearing pony hoofs…the blouse is interesting but wearing in such a sloppy way doesn’t give it the credit it truly deserves! no to the Mr Tumnus feet. Somehow I am imagining her shoes are tailored split toe hooves, could it work? Scott…,it’s time we saw some new photos of Lino,Luca,Alessandro,Domenico,Matteo,Lapo,Valentino…and the wonderful Ana! It may be the angle, it may be the moment, but the blouse gathered up by clutching the brochure makes both the blouse and the skirt unflattering. The shoes are just hideous and would be hideous on any woman. This outfit has gone slightly awry, maybe when she parachuted out of the Fashionista Air Force combat plane. She made a partially successful comeback by gathering her parachute into a skirt but forgot to tuck in her blouse. Maybe the horse’s hooves footwear are part of her uniform in the Fashionista Cavalry. John from Philly…you’ve got to start your very own JfP Fashion Police YouTube channel…your vivid fashion imagination and wit and humour…puts fun back into fashion! Why copy my comment…are you lost for using your own words?! Obsessed with this look! Especially the shirt is really beautiful! I love this. Yes, there is a lot of disarray in this but for me that’s part of the charm. Also, she looks very busy to me. I hate those corporate woman outfits, everything sandblasted down to an “outfit”. This speaks to me of individuality and charm. I totally agree. She shows personality with the combination of clothing items – while still looking very attractive and interesting (without the need to show tons of skin, legs or cleavage). I so agree with both of you. This is one of my favorite photos on this site,I think because of the mixture of trying, but not trying to hard; succeeding to a large extent, but still looking a bit chaotic. I find the overall effect charming. Agree. I love this look. WoooOOoow this skirt is really interesting, I can’t get over it. It has a crumpled look but it’s beautifully tailored, too. She looks great. She’s a mix that includes a paratrooper, a schoolteacher out of some classic novel and a pony on the loose downtown….. too difficult for me to decipher and certainly not in my taste! Sart … I’ll give you credit for showing different looks than what we usually see from your Italian sojourns. That being said, I’m in way over my head here. I haven’t seen anything that I can understand, much less appreciate, but I realize that this blog wasn’t created just for my benefit. I’ll sit here curbside at my imaginary bistro and wait for the ordinary folks to wander by. Call me when you’re on your way here. I think I see what she wants to do here, but it does not resonate well with me. This would look original something like 10 years ago (or more). Now it looks rather dated. But then, again, it’s Monday and I am gloomy. This look is insanely chic. Every piece of it. ESPECIALLY the boots. I’d buy them if I knew what they were. 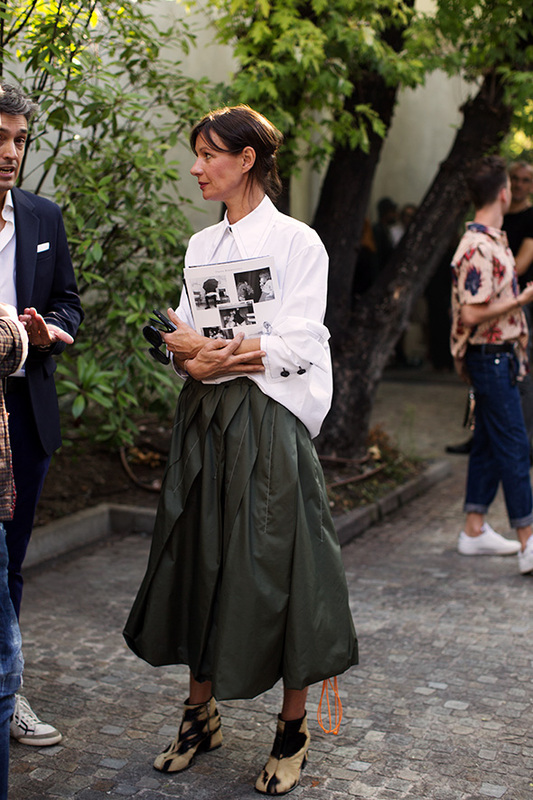 Love the (parachute) skirt. It is very voluminous, so a slim, fitted top should be worn with it, along with strappy sandals. What ever the faux pas–She gets away with It! Love the total look, interesting take on Tabi’s. The skirt! THE SKIRT!!! I love it! You’re right! totally love it! Could someone help me with the name of this woman? I remember her face, and cannot check if I really do know her. Where Oh where can I get a skirt like this one? Who designed it anyway? Unique yet familiar somehow. Not sure if I had something like this way back when I was younger.